Every day, without realizing, we are exposed to hundreds of chemicals. What’s surprising to many is that exposure to these toxins doesn’t just happen when we step outside our homes. These harmful chemicals can exist in everything from our makeup to soap and other personal care products. Too often, we buy beauty products without checking the ingredients label and unfortunately not all beauty products carry an ingredients label. 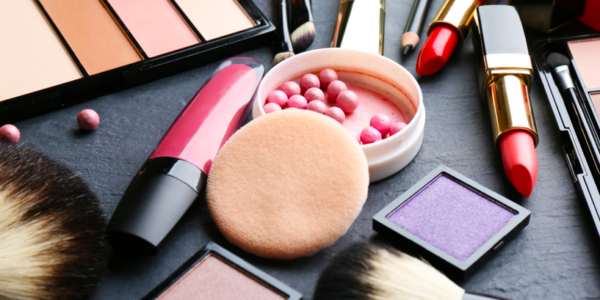 In the Federal Food, Drug, and Cosmetic Act (FD&C Act), beauty products with ingredients other than color additives, do not need FDA approval before they go on the market. We figure that if these products are being sold in our favorite stores, then they must be safe. However, many of these products aren’t safe, and they contain chemical ingredients that are mostly untested and unregulated, with some of them known to be carcinogenic (cancer-causing chemical) and disruptive to proper endocrine function. These chemical endocrine disruptors can mimic the effects of hormones, compromising the performance of our glands. Chemicals such as Bisphenol-A (BPA), a substance often present in food containers, plastic water, and baby bottles, and phthalates are endocrine disrupters that can contribute to weight gain as well as many other disorders. Phthalates can cause damage to the endocrine system that naturally controls body weight. As endocrine disruptors, they have been linked to weight gain, as well as the increased risk of breast cancer, congenital reproductive disabilities in males and females, and early breast development in girls. Previous research studies have linked phthalates to asthma, ADHD (attention-deficit hyperactivity disorder), breast cancer, obesity type II diabetes, low IQ, neurodevelopmental issues, behavioral issues, autism spectrum disorders, altered reproductive development, and male fertility issues. Phthalates can be found in cosmetics, fragranced lotions, body lotions, hair care products, and nail polish. On product labels, look for the word “fragrance”. These companies are not required to write more than the word “fragrance” on their packaging, but the fragrances used are phthalates. Other names phthalates go by include: butyl benzyl phthalate (BBzP), dibutyl phthalate (DnBP), di-2-ethyl-hexyl phthalate (DEHP), diethyl phthalate (DEP), di-butyl phthalate (DBP), benzyl butyl phthalate (BBP), diisobutyl phthalate (DiBP), diisononyl phthalate (DiNP), di-n-octyl phthalate (DnOP), dipentyl phthalate (DPP), di-isobutyl phthalate (DiBP), di-isononyl phthalate (DiNP), di-n-octyl phthalate (DnOP), di-isohexyl phthalate, dicyclohexyl phthalate (DcHP), and di-isoheptyl phthalate. Found in 90% of personal care and cleaning products, SLS has been linked to skin irritations and other issues such as hormonal imbalances, kidney, and respiratory damage. Residual levels of SLS can be found in the brain, lungs, liver, and heart following the prolonged use of products that contain this substance. Because it is an inexpensive surfactant acting as a detergent, an emulsifier or foaming substance. SLS is widely used in shampoos, toothpaste, mouthwash, body wash, soaps, detergents, along with other harmful chemicals such as Sodium Laureth Sulfate (SLES) and Ammonium Laurel Sulfate (ALS). On product labels, look for Sodium Lauryl Sulfate (SLS), Sodium Laureth Sulfate (SLES), Ammonium Lauryl Sulfate, Sodium Myreth Sulfate and avoid these products. Today there are many products with the SLS free label on them. Go for these beauty products. Mercury can often be found excessively in some skin lightening creams. It is also found in anti-aging creams that claim to remove freckles, age spots, blemishes, and wrinkles. When mercury enters the body, it can damage the liver, kidneys, and brain. Prolonged exposure to inorganic mercury can harm the central nervous system. On product labels, look for mercurous chloride, calomel, mercuric, Mercurio, and mercury. Formaldehyde is a carcinogen, a proven cancer causing agent, but this does not deter companies from putting it in some hair straightening products. Formaldehyde has been detected in some of the products from the most prominent cosmetic brands including nail polish and nail polish remover, hair conditioners, toothpaste, some baby wipes, and perfumes made with synthetic fragrance. Although formaldehyde is a carcinogen from long term exposure, exposure to the vapors of formaldehyde will also produce short-term symptoms such as headaches, itchy or burning eyes, and nose. Formaldehyde exasperates asthma and respiratory difficulties found in about 20% of the U.S. population. Formaldehyde from these products may also lead to depression, insomnia, mental confusion, nose bleeds, rashes, joint pain, disorientation, fatigue, hoarseness of voice, nausea, and vomiting. Be cautious of parabens in your creams, makeup, hair care and shaving lotions. Parabens are commonly used as preservatives in cosmetic products increase shelf life by preventing the growth of harmful bacteria and mold. Typically products have more than one paraben in them to cover a broader range of microorganisms. On the downside, parabens possess estrogen-mimicking properties that are linked to breast cancer and other hormonal disorders. To avoid parabens, on product labels, look for Alkyl parahydroxy benzoate, Methylparaben, Propylparaben, butylparaben, ethylparaben, and isobutylparaben. There is a slew of other chemicals that can found in your beauty products that you may not even realize. That’s why you want to aim for natural beauty products that are mostly chemical free. These chemical-free cosmetics are sold at most drugstores and health shops. Although they tend to have a shorter shelf life and may be slightly costlier, However, they are definitely worth the effort in the long run. It is best to avoid these chemicals also if you want to lose weight since fat tissue also serves the body as a storage for toxins, preventing these toxins from causing damage to more bodily tissues.You will find it harder to shed off excess fat tissue when your exposure to toxins is high. So for your health and beauty, it is wiser to go for natural products. Jerrold J. Heindel, Bruce Blumberg, Mathew Cave, Ronit Machtinger, Alberto Mantovani, Michelle A. Mendez, Angel Nadal, Paola Palanza, Giancarlo Panzica, Robert Sargis, Laura N. Vandenberg, and Frederick vom Saal. Metabolism Disrupting Chemicals and Metabolic Disorders. 2017 Mar; 68: 3–33. Giuseppe Genchi, Maria Stefania Sinicropi, Alessia Carocci, Graziantonio Lauria, and Alessia Catalano. Mercury Exposure and Heart Diseases. 2017 Jan; 14(1): 74.